My potato kick is still going strong. It started innocently enough with my Chocolate Chip Cookie Pota’Dough Dip and since then I’ve fallen in love with potatoes all over again. They are so filling and comforting! I don’t know why I ever fell off the potato bandwagon. If I had a dime for everytime I forgot about a favourite food and then discovered it all over again, I’d be rich. We love our burritos around here, so last night I made potato and black bean burritos…with a spicy kick. Potatoes are tricky; they can make an entire dish bland if we’re not careful. I made sure to amp the burrito mixture up with jalapeno, chili powder, and cumin to pack in some heat and flavour. I don’t suggest going skimpy on the toppings either. I added a spoonful of salsa, a few slices of avocado, and handful of cilantro. Without the toppings it was decent, but with the toppings it’s now a recipe I want to tell you about. Oh and shredded kale thrown in for good measure. I’m also on a shredding kale kick and I can’t seem to stop. 1. 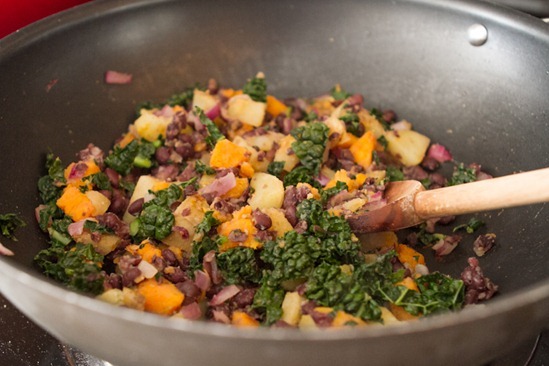 In a medium-sized pot, add the chopped potatoes and cover with water. Bring to a boil and then reduce heat to medium. Gently boil/simmer for about 12-15 minutes, or until just tender. 2. Meanwhile, preheat a large skillet with 1 tsp oil and sauté the red onion over medium heat for a few minutes. 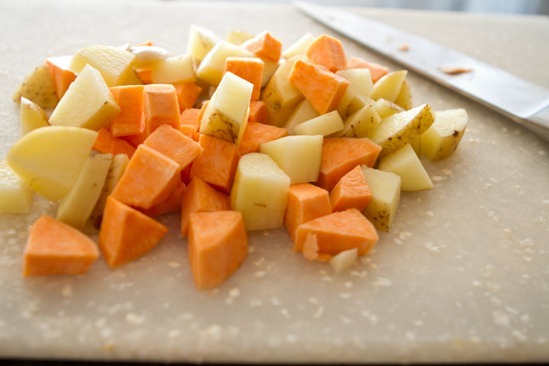 After boiling the potatoes, drain and gently mash them up a bit, leaving some chunks for texture. 3. Add potatoes to the skillet mixture and sauté for another 5-10 minutes or so, reducing heat if necessary. 4. Add in the diced jalapeno, tomato, chili powder, lime, and cumin. Season generously with salt and pepper and stir well, heating for a few minutes more. 5. Finally, stir in the kale and black beans and sauté until heated through. Adjust seasonings to taste and portion on large or x-large tortilla wraps. 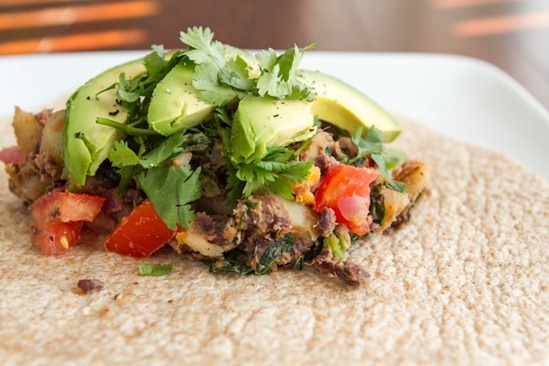 Top with avocado, cilantro, and salsa…or whatever you wish! 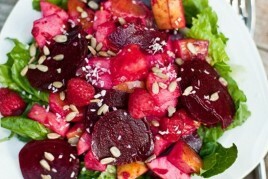 Use leftovers on a salad for a fun twist. If you find yourself with any leftovers, I suggest spooning the mixture (heated, if you’re down with that) over a salad for lunch. 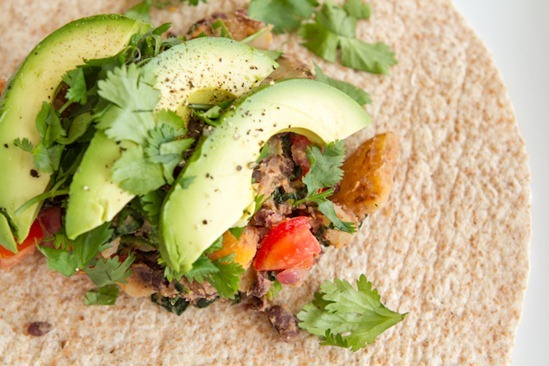 Top it with avocado and salsa and you have yourself a filling burrito in a bowl. Yum, I have to have these this weekend! Ooh, these sound really good! I love baking sweet potato and black bean burritos, and then freezing a bunch to have on hand for a quick, ready-made meal. Great idea to add salsa and avocado as toppings! I have made my own sweet potato and black bean burritos several times, but pureed them…my husband thought the texture was gross. I will have to try your method, it seems like it would make for a more chewy texture. 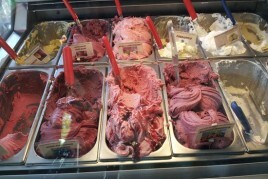 I have only one word….. YUM! These looks so good…and they have two of my favorite things! Sweet potatoes and avocado! Yum. 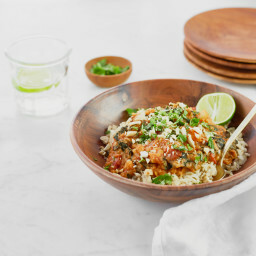 The perfect dinner or easy leftover-for-lunch kinda thing! I used to work with a girl who swore by eating a potato every day for lunch because of how high the mineral content is. They’ve had a bad reputation since the low carb craze, but I’m glad to see you incorporating them into your meals! I LOVE burritos. This recipe has me very excited (and hungry for a burrito, even though it’s 8:30am in the morning here in Van)! I’m going to pin this right now! Yum!! We are having smothered burritos for dinner tonight, and you just convinced me to fill them with potatoes and black beans and kale!! So, thank you! :D And FYI, my (non-veg) husband and I LOVE your recipes. I’m so happy to hear that Stephanie, enjoy! What a Nice mix, really nice ingrediences! Must try that, cause I just love burritos. Have a wonderfull weekend. That looks so delicious! I love a good burrito!! And you’re right, that would be delicious on a salad the next day! thanks for sharing! That looks so delish! I’m on an avocado frenzy the past few months; they’re so fantastic. Any suggestions on a good food processor? in short it’s a decent machine, although needs a few improvements in my opinion. I still like it better than my old kitchenaid though. Angela I’ve been a OSG stalker for so long I decided it was time to let you know how much I enjoy your recipes. Rarely do I blog a food related post that OSG isn’t mentioned. I am so excited to do so many of the recipes on your blog. My partner and I are slowly moving into the vegan world… and we are super excited because before we found your page we thought about all the food we would miss and NOW… I am feeling like this is totally doable and exciting. Thank you for writing this BLOG! That is wonderful to hear. I remember when I discovered the same thing. I hope you enjoy the recipes Julieanne! My favorite burrito combination is black beans, diced sweet potatoes, spinach, and chipotle pepper in adobo, but I think I’m going to have to try this one! I never eat white potatoes but could probably eat them in this! Great looking filling…the avocado slices are just gorgeous on top, too! Oh, this looks like something I will love! Yum. These look delicious! I love sweet potatoes in burritos. I normally make a sweet potato/black bean/kale enchilada dish, but this look much less time consuming! I’m bookmarking it for the perfect weeknight dinner. Thanks! 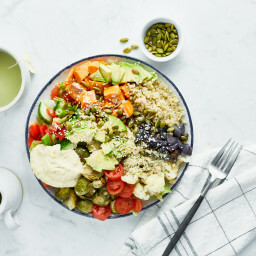 Just started Eat to Live program- these look PERFECT for dinners next week served over salad- Excited just thinking about it Hopefully I can find dinosour kale at the farmers market tommorrow morning! Thank you so much for the recipe-you are a doll! 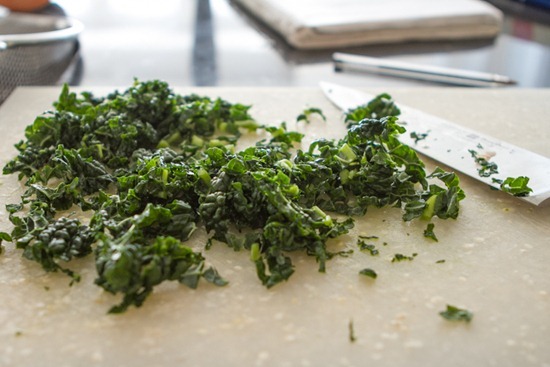 Shredding kale- what the what?! I’m all over that!! These look absolutely fabulous! Love this idea! I wish we could buy your meals in the freezer section! ;) Maybe one day… I hope you have a great weekend, Angela! We had sweet potato and black bean burritos with shredded kale last night for dinner! It was actually inspired by your sweet potato and black bean enchilada recipe. One of my favorites! This is perfect. i just turned in final projects at school and I don’t have the time/creativity/space of mind to figure out a meal plan for this week. Stuff-n-go burritos with lots of leftovers it is! Thanks for making my stomach growl! Loudly! earlier this summer i totally jumped back on the potato bandwagon again too – my favorite way is roasting with lots of onions and serving with pesto! Angela, what’s your method for shredding kale? Your burrito looks amazing. I am currently obsessed with avocado! My gosh, I’m in love with potatoes right now too! I can’t get enough of them. I love that you added them to a wrap. I’ve just been throwing a whole sweet potato in the BBQ for 45 minutes then eating it with a fork, hemp seeds and coconut oil. Nothing fancy and definitely not that pretty looking. As always, your lunch totally outdoes mine on presentation. I love the kale mixed in there, so colorful! I am cooking these right now! I had to take a taste….who would have thought that black beans and potatoes would become my new best friend. Without any of the toppings, wrap or anything, the guts of these taste phenomenal!! Thanks Angie for a great new recipe! I am trying the Eat to Live program as I was recently diagnosed with very bad arthritis (no wonder it was hard to work out). This program is supposed to help alleviate all kinds of various medical issues including inflamation as well as hormonal imbalance. Hope it works! I have been scouring all your recipes again (even though I already make so many of yours)….looking for further inspiration. Hey Linda, I’m happy you enjoyed it so far! Thanks for your kind words, I’m honoured that you enjoy the blog so much. Yum! I love wraps that feature black beans as a base. I tasted a coworker’s wrap at lunch the other day and it was all shredded cheese and dressing – gag! Ah, this looks amazing! I feel very blessed to have your creative recipes shared with me!! YUM! Potatoes are what make it. ;) Great recipe! This looks perfect for the weather today! sunny but chilly. Potato, avocado, beans; you really cant go wrong here! Mmmmm, these look so good! 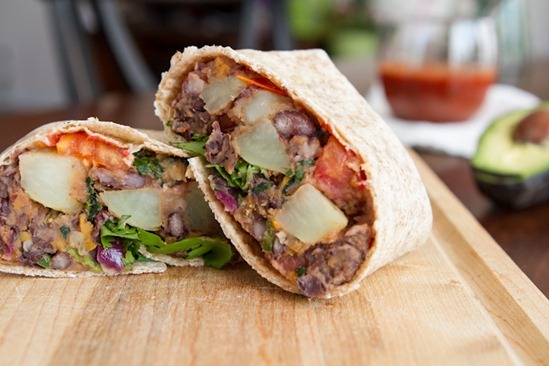 I love the idea of using potatoes in burritos instead of rice, and the idea of using the leftovers in a burrito bowl is so tempting to me that I may skip the tortilla and go straight for the bowl! Growing up our family was so poor we’d eat nothing but potatoes for weeks on end … Mom would buy them buy the bag since they were so cheap and filling! I love it!! I have a new love for avocados and they are so perfect with black beans. Your burritos always look so good. What brand of whole wheat tortillas do you use? Hi Angela! I’m so excited I just found your site, I love your blog! I’ve just been trying to get into vegan/vegetarian cooking so I can’t wait to try out some of your recipes! Starting with these burritos :) I’m still not a big kale fan but I’m willing to give it another try! Hey Kristina, Im glad you found the blog, thanks for your kind words! I hope you enjoy the recipes. Ooh, this looks yummy. I love potatoes in tacos and burritos! These sound awesome, and now you’ve got me craving Mexican food, which isn’t hard to do. Hey Vanessa, Im happy you love them too! Mmm…I’m still on a potato kick too (or maybe it’s a potato high haha). I definitely see some sort of burrito in my future. I might be turning to a rice kick as well…mainly because it’s been a long time since I’ve made some and it’s time to get back into it! Thanks for the recipe! I made this last night and it turned out great. I didn’t have any kale so I used chard instead. Your butternut squash burrito recipe is one of my favorites -this can be a good substitute when squash is out of season. Coat the apples in the cinnamon and sugar in a large bowl. Saute the apples over medium-high heat in a skillet in the oil until soft, add in the blueberries the last five minutes of cooking. Mix the flax and chia with 6 T. water in a bowl and let sit for 5 minutes. In the bowl used to coat the apple, mix together the oat flour, spices, and salt. Add the vanilla extract, yogurt, and almond milk. Stir to combine. Mix in the chia/flax mixture last. Pour the apple/berry mixture into a greased pie pan (or cast iron skillet can work). Even out the filling. Pour the batter over the fruit last. Make sure the batter is evenly coating the fruit and level on all sides of the pan. In a pre-heated oven at 450F, bake the apple baby for 20 minutes. Serve with sliced fruit, agave or honey and a dollop of yogurt. OR sprinkle with powdered sugar. Makes a great 450 kcal (2 slices) breakfast! mmh, I love burritos!! They sound great, I’ll try them for sure!!! Thanks!! I love burritos in the summer! These look so yummy!! I love the combination of avocado and blackbeans! These looks so great, I definitely have these on my to-do list to make for dinner this week. I also like your idea of adding potato…you’re always thinking! Can’t wait to make these girl! Made these tonight and had them for dinner and lunch! They were delicious!!!,,. Just started following your blog and am loving it! Trying your vegan burgers later this week !!! Can’t wait!!! Love your vibe and what you are all about!!! I made these burritos last night, and they are kid tested and approved! It is huge when I can make something the whole family will eat. Thanks!! Angela I have made several of your recipes and love them all. I have been vego for a few years and after doing a fasting juice detox a couple of months ago I have been whole food, mostly wheat free vegan with no desire for rubbish food. I’ve made lots of your recipes with some of my faves so far being the Red Quinoa Salad, the oat squares, ooh the raw energy cookies, the overnight oats and green monsters, the banana spelt oatmeal cookies, the veggie burgers and the maple baked beans. And now these burritos. I made them tonight and love them! I added some fresh corn cut off the cob and some red capsicum. I am still a bit scared of kale so subbed in silverbeet. So thankyou, you have helped me be more adventurous with ingredients and recipes and I love that all of your ingredients are body and environment friendly. Looking forward to the next ones! Thank you Tamara, it’s a pleasure to meet you! I made these for dinner tonight and my fiance and kids loved them! Thank you so much for sharing all of your wonderful recipes, I can’t wait to try more!! I used red potatoes (new) w/ skin on and a pretty big sweet potato… and I cut the corn off a cob and threw that in too. YUMMMM……. I just put it over some of the extra kale I had, w/ avocado on top. Super delicious! I’m so happy you enjoyed it! Great call on the subs, I’ll have to try that! I just made this for dinner. Oh my! I will be adding this to my list of favorites! This was the first vegan meal I’ve ever made and it was delicious. My husband and I are not vegan and both loved it! It was a nice change and it was a combo I wouldn’t have thought of. But anything with Avacado, cilantro and black beans, YUM! Consider me a loyal fan of your blog. Off to find my next vegan recipe! This was amazing. My fiancé and I both loved it and we are full on meat eaters! Thanks for sharing. Thank you again for a great recipe. I finally made these last night adding mushrooms, corn, and mixed peppers to bulk it out a bit. This was really delicious and we’ll be making it again and again. 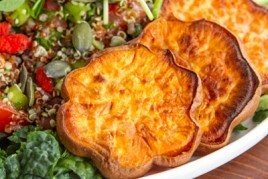 We don’t typically enjoy sweet potatoes, but in this combination their sweet flavor really balanced the dish out nicely. I want to thank you so much I want to cry. It has been so hard to remain diligent with just eating a plant based diet because of sheer boredom (I end up eat veggie chili for a week and then began with rice and beans) you have given me the spark I need to keep it going for myself and my son. I sooooo need this. I wish you many thanks and blessings and as soon as the cookbook is published I will have a copy for myself and one for my mom who wants to do the same. I would hug you if I could!! Hi Kim, Thank you so much for your lovely note! That means the world to me. Goodluck with your efforts! I have the tendency to get into food ruts too and it’s amazing what a couple new recipes a week can do for a boost. Take care! Made this today I add extra tomatoes (I love them so much) and my 2 year old mini me eats it up like it’s candy. He loves, loves beans. Thank you so much! Made these for dinner tonight and try were absolutely delicious & a huge hit with my kiddos! Amazing as always…we had these last night and left overs today. SO GOOD!!! I added red and yellow peppers and mushrooms. Going in the recipe box!!! These are absolutely delicious. Can’t wait for your cookbook to get to my house. Thank you Angela. These burritos are amazing!! Not only does it taste incredible but my house smells beautiful! Easy and fun to make, this recipe is a definite repeat. Thank you! These look absolutely fabulous, I love this idea! I’m bookmarking it for the perfect weeknight dinner. Thanks for the recipe! 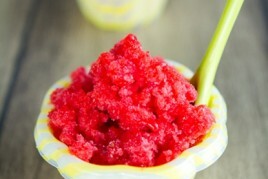 Previous post: Summer Fever Strawberry Lime Granita…just 4-ingredients!